Out of all the things that you can feel safe letting your kids handle, a telescope is at the top of the list. Whether low or medium priced, these products are made to be handled without worry of them breaking when being used as a portable device. With all of the great options available to get them started, the below list is a good starting point for what telescope to look for when making a purchase for your kid. The Orion 10033 Funscope makes a good purchase for kids, and is at a low enough price that it warrants a look or two. Weighing in at only 4 pounds, this is one of lightest telescopes on the list and can be taken anywhere. It’s small enough to be put in a standard sized backpack but powerful enough to be useful for stargazing. Included is a 76mm optic that transfers more than 60% more light than other beginner telescopes. Pay less and get more, smaller yet more powerful, and the software included isn’t half bad. Using the Orion Moon Map 260 kids can find out all of the features of the Moon with less worry about having to hunt down every single fact. The scope is even powerful enough to see star clusters, the brightest planets in our solar system and nebulas. Dimensions of the product are only 8x8x13.5 making it perfect for kids of all ages. Not many portable scope have the power necessary to keeps kids entertained, but the FunScope is a notable exception. 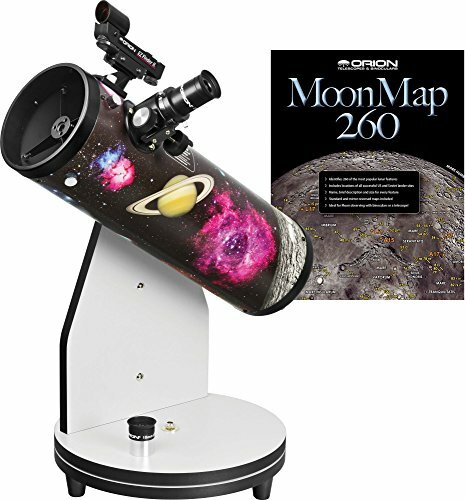 The first medium priced telescope on the list is the Orion FunScope Astro Dazzle 4.5″ Reflector Telescope Kit that offers a fun but slightly advanced option for kids that are already on beginner level. Inside the box is a 25mm and 10mm eyepiece, EZ Finder II sight, Star Target planisphere, Astronomy Book, MoonMap 260, and Starry Night SE astronomy software as a digital download. This is as packed a kid’s telescope as you are going to get for the money without overwhelming them. The base is sturdy and preassembled with motions for north, south, east and west. When moving it it’s buttery smooth in all directions so that you don’t have to struggle with tight movements. Orion went to work with the design of the telescope and made it the most attractive on the list, with a look that they term Astro Dazzle. Don’t ket the 4.5 aperture fool you, as it has wide field viewing and can catch just about anything that a scope twice its size can. Having the same portability and similar weight as the previous telescope, this is a good deal for someone that is interested in something else in the FunScope series. Last on the list is also one of the best, and once again it is a low priced product from Orion. The Orion 10034 GoScope II 70mm Refractor Travel Telescope Moon Kit is a complete beginner packet for kids with everything they need to get started, and completely portable so they can take it on trips or over to a friend’s house. Using the included tripod is great because of its sturdiness, but it is also light enough to not be a burden thanks to the aluminum build. When on the go the specially designed backpack can hold the 70mm telescope, tripod and every accessory in the box comfortably. This includes the 5×24 finder scope and two 1.25 inch telescope eyepieces. 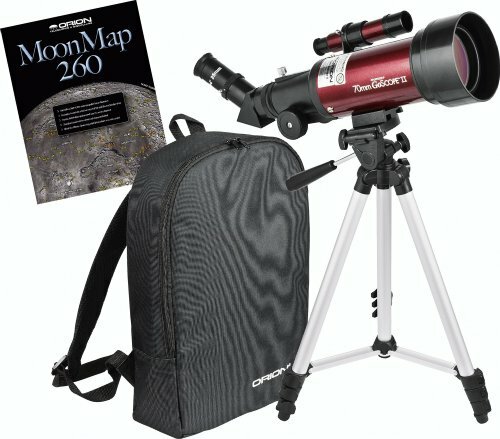 For kids that are interested in the Moon it comes bundles with the Orion Moon Map 260, which by itself is already a good value. With a total weight of 6 ½ pounds they can carry this all on their back with the bag without it weighing them down. Definitely one of the winners when it comes to complete package, this is an excellent product to conclude the list. Second to last on the list is the Orion 09798 StarBlast 4.5 Equatorial Reflector Telescope, a medium priced product with high end capabilities, even for kids. The prize feature of this is going to be the mount, an EQ- equatorial that turns tracking into one of the easiest things to do at night, even while using slow motion controls. While providing a wide field of view the f/4 optics handles both short and long views beautifully without requiring the user to do a lot of customization with the controls. The Expanse telescope eyepieces are very well made and provides a 66 degree apparent field of view, one of the better ones on the list for a scope of this price. This is another telescope from Orion that can last kids for years through their growth of astronomy without them having to switch out to a more powerful scope. Weight is only 20 pounds with dimensions in the range of 20x12x44 so that it still maintains some decent portability. Making into the upper tier of products being offered on the list, the StarBlast is one you shouldn’t be without. At the start of the list is this low priced Orion that comes packaged with a lot of beginner friendly material to help kids get started in the world of astronomy. That’s a good reason why they included the Star Target planisphere round star chart so that you can check out what’s in the sky at any point throughout the calendar year. Also bundled is the Orion MoonMap 260, a very unique software if used in combination with the others. Using it kids can find the names of several features and objects on the Moon, further educating them during their exploring. Reading through the Astronomy book that Orion provides is a great way to get used to all of the terms used with space exploration, and is so interesting that in the beginning your kid may spend more time in it than using the scope. A complete introduction to backyard astronomy is the highlight of its teachings and is the prime lesson to get your kid started. But the scope itself? It uses a 60mm refractor using two coated 1.25 eyepieces that are high quality glass lens, and not the cheap plastic ones you would find on a lesser telescope. The first and one of the best, this ranks very high as a telescope for kids. Orion strikes again with this low priced teal telescope that includes a lot for users of all levels. Accessories included are two 1.25 inch telescope eyepieces, an EZ Finder II reflex sight, smooth rack and pinion focuser, the Starry Night astronomy software suite and a reflector collimation cap. The instructions provided make sure that kids have a full understanding of what all the accessories and features do, so even without the help of an adult they will be able to operate the scope. Use of the EZ Finder II reflex sight will be the most valuable since it helps to find celestial objects in seconds. Mount and tripod stability is at its finest, and offers smooth motions in all directions when following comets. And light gathering is very good when you consider the full power of the 76mm aperture reflector telescope. With the light weight and nice portability of the package, this is an idea bargain for the kid astronomer. Priced right and with just the correct amount of features this is a good buy. Another medium priced scope from Orion but in a different series is the Orion StarBlast 4.5 EQ Telescope & Beginner Barlow Kit. One of the shining items included with this set is the Discover the Stars book, a very descriptive and full-fledged beginner astronomer piece. This book can easily have hours sunk into it and still have more material left to cover. Whenever you want to plan stargazing sessions you can easily use the MoonMap 260 and Star Target Planisphere to lessen the time. These two in tandem are worth the price of admission by themselves, and go a long way in selling the value of the product. Two Shorty 2x Barlow magnification pieces boosts the power of the included eyepieces by double. The aperture of this telescope is good but it gets its points by having a wide view so that you can see all of the action with less movement. If you factor in how sturdy the base is, this is one of the better deals on the list and will last for years before you even have to think of upgrading. Easily one of the best, the StarBlast is made for kids and beginners. Orion Telescopes and Binoculars is a very good company and one of the most recognized in the telescope industry. The surprising thing is how young the company is, and that it has only been around since 1975. Founder Tim Gieseler has close ties with Synta who manufactures the Orion Brand name that is found on this list. Don’t let that turn you off, as it is a big plus since Synta is known for their build quality. You’re not going to find a manufacturer with a better track record than Synta. Orion is very active in the community and you can often find them advertising their products in big name magazines like Sky & Telescope and Astronomy. Typically if you want something for an amateur or beginner, Orion will probably be on the list of the handful of companies you look at. This is because their pricing structure is fair and usually lower than the competition, but it also means that their advanced and professional telescopes are slim in lineup compared to the other companies. Orion does have flagship and high end models, but the number of available series is less compared to say a company like Celestron. But for the meatiest lineup of beginner to intermediate scopes, they are going to have a leg up and will offer a price that will either beat or be competitive to the others. If you also add in how many of their products contain a lot of freebies are extras, it’s hard not to notice how good of a deal you’re getting. Buyers should expect the same build quality from a high end telescope as well as a low end telescope regardless of how much it costs. Orion is the great buffer to ensure that is the case and continues to be a solid choice for beginner to intermediate astronomers. Since the price was already covered, the big thing to take into account with the Orion line of scopes is that all of them on the list are portable. This comes into play when your kid needs to take the scope away from the house. Usually a kid with an expensive piece of equipment like this would have issues with taking care of it and keeping the accessories organized. But since many of these were built with all of this in mind, they are all light and durable enough for all ages to carry. None of the telescopes listed are bulky in any way and provides the perfect companion to the usual heavy school backpack. Your kids will not be weighed down by any of the telescopes on the list, especially those that come with their own carrying bags. The ones that come with carrying bags also have a great way to organize the accessories so that they don’t break while being transported. This is one valuable product that you’ll feel safe letting your kids take out of the house on their own. Take a deep breath and enjoy the quality that Orion provides, even on their low cost models. There has also been a big debate on whether Orion offers the most accessories with their purchase, and has the best software attachments. Although it is a debate that will probably never end, there is a lot of merit to it. 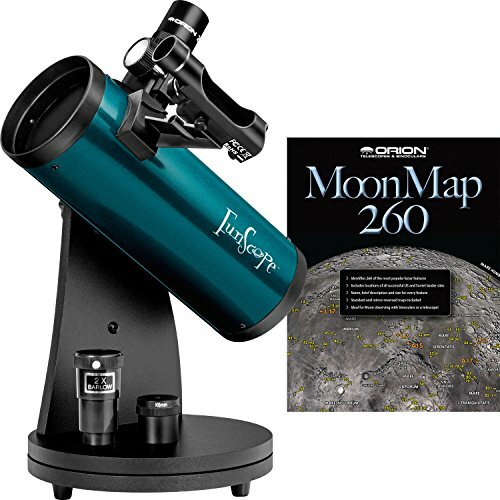 The MoonMap 260 by itself is a great value that is sold for a pretty safe price, but all of the telescopes on the list come bundled with it by default for free! This is an incredible value, and one of the many great things that helps a young astronomer get started. There aren’t many comparable bundled programs on the market, and it’s one of the reasons Orion is so highly recommended. Currently this is the best beginner software that comes with scopes for getting people acquainted with the Moon and all of its intricacies. Another included accessory is the Star Target planisphere which gets all users acquainted with the most well-known constellations in the galaxy. This small movable chart is detailed enough to provide a lot of information or as little as you need to get started. It still has a small learning curve associated with it, but nothing that is too steep that a kid won’t be able to master it. The main thing to keep in mind that it is a massive amount of information all in one chart, so don’t be surprised if your kid spends the entire night trying to find everything on it. Interestingly enough, Orion also bundles a book called Astronomy Book that can be bought separately. This ingenious little book serves as a companion guide and contains helpful facts, illustrations and guides to get you started. This is one of the many books that they sell, and is their most popular beginner book. In fact, looking at Orion’s library of offered books shows that this is the most recommended for kids of all ages. An issue that the company has worked hard to resolve is the length of time needed for a beginner astronomer to upgrade their scope. Back in the day there used to be a big gap between a beginner astronomer and an intermediate astronomer. This has now been remedied by Orion and other companies, and a beginner telescope can be used by intermediate users without any loss in quality. Because of this, choosing the right telescope for your kids from the beginning will keep you from having to purchase another one as they grow in education with their hobby. The next purchase will only have to be for an expert telescope, and with any luck they will already be on their way to college! Every kid should enjoy the quality of a telescope that will last them through school and get them started with the world of astronomy. With prices these low for kids telescopes, there is no doubt you will find everything you need and more from this list.